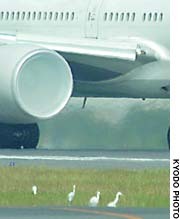 Tokyo’s Haneda airport could have been a wild bird sanctuary, but officials go out of their way to scare them off. Officials entrusted by the airport authority patrol around the runways — used for more than 800 takeoffs and landings a day — and fire blank shots or detonate fireworks between flights to scare away birds so they will not be drawn into aircraft engines or otherwise impacted by planes, which could lead to a crash. The nation’s airports last year recorded 1,117 bird strikes, according to the Land, Infrastructure and Transport Ministry. Haneda had the most, at 115. On Aug. 15, a large flock of black-tailed gulls arrived at Haneda, prompting the airport authority to close runways intermittently for about two hours. Travelers in the middle of the Bon summer holidays were stranded, with 16 flights canceled. 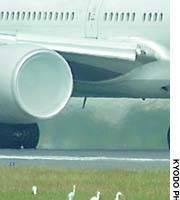 Airlines and the airport regularly discuss the problem. Masahiro Suzuki of All Nippon Airways Co. said frequent mowing of the grass has helped keep a certain type of gull at bay because they have less clover to feed on. But chasing the birds away each time they accumulate is still the most effective ploy, said Suzuki, who is dubbed Dr. Bird by colleagues for his years of bird ecology studies.